One of our families favorite dinner dishes is pasta. My kids will eat any type of pasta any day of the week. However, they won’t eat every type of pasta sauce. If the vegetables in the sauce are too noticeable the sauce will not be eaten. 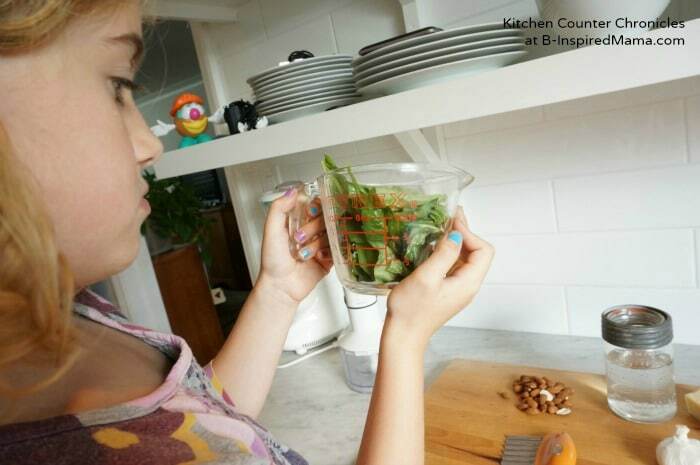 As a mom, this can be incredibly frustrating…I’m just trying to feed my kids healthy food. Over the years I have learned that if my kids make their food, my kids will eat their food. So, I try and find ways to get my kids cooking in the kitchen. 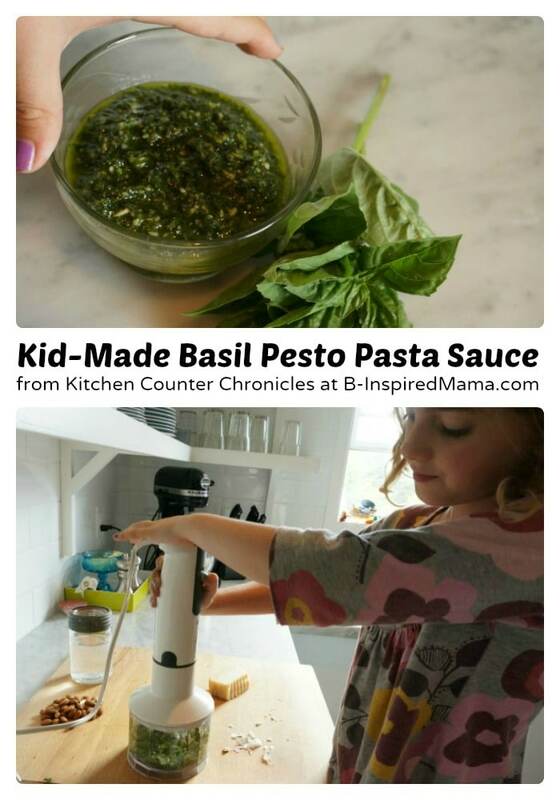 This is why I love pesto…it is so incredibly easy for kids to make. 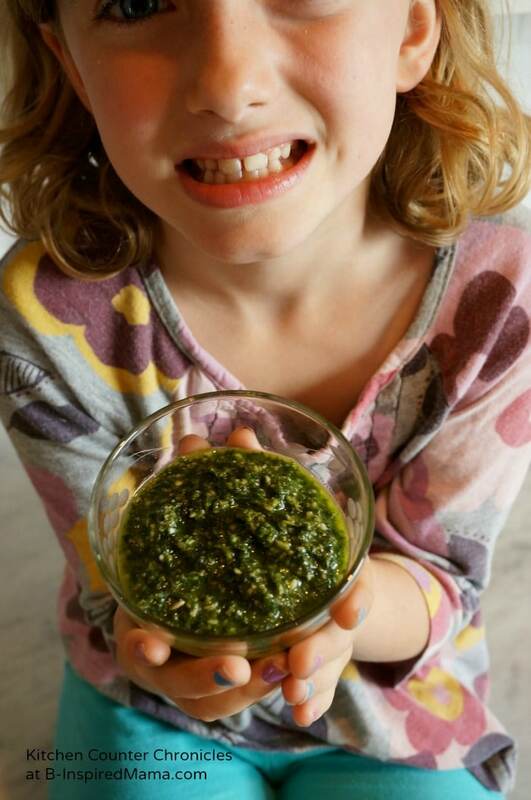 This delicious basil pesto can be (almost) completely made by a kid. 1. 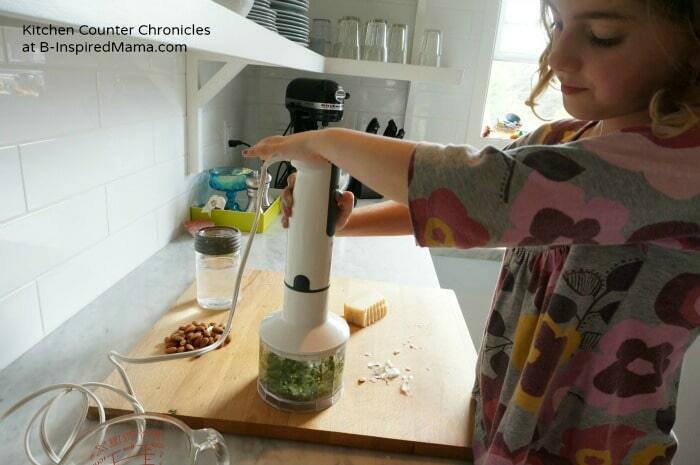 Chop the basil leaves in a mini-food processor. 2. Add the garlic clove and the sliced almonds to the processor and chop some more. 3. Next, cut off a chunk of parmesan cheese and added it to the processor. 4. Finally, add the salt and olive oil to the processor. Add as much olive oil as you would like, depending on how loose you want the pesto to be. My daughter is always so proud when she makes a dish for the entire family. With a big pot of pasta, the pesto dinner is complete. This kids recipe is very simple and flexible. It is easy to swap out ingredients. If we don’t have any basil we have grab spinach and we have even used kale. Sometimes we don’t even use any nuts…but, we have used pine nuts and we have tried sunflower seeds. The absolute best part about this pesto is that when I bring the dinner to the table everyone enjoys eating it. It passes the official kid pasta sauce test…every single time. My kids are big pasta fans, too. But we haven’t tried Basil Pesto with them yet. What a great way to get some green in them. Thanks, Jen! What’s your family’s go-to kids recipe that your kids love to make? I’d love to hear about it in the comments below!